Those of you that follow the blog should remember the 3D Vision stereoscopic 3D test system with water cooling that I’ve built. In the meantime I’ve been upgrading the test PC a bit by bit, but since it is based on a bit older platform already I decided to do some testing with the recently announced Intel Sandy Bridge platform. The 3D test computer currently used an Asus P55 Sabertooth motherboard together with an Intel Core i5 750 processor overclocked to run at 4 GHz 24/7, together with dual GeForce GTX 580 video cards in SLI setup. 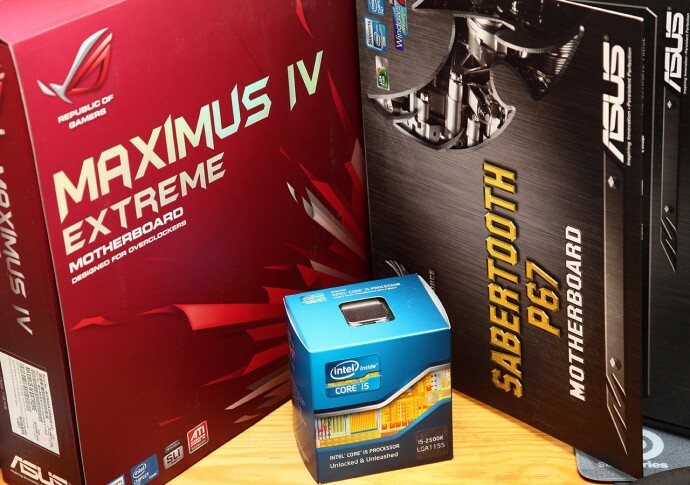 So I’ve got two more recent high-end motherboards from Asus for testing that are based on the new platform and use the P67 chipset – Asus P67 Sabertooth and the P67 Maximus IV Extreme and an Intel Core i5 2500K processor with unlocked multiplier (for overclocking of course). The goal of this test is to reach five gigahertz by overclocking the processor and measure the performance of the new Intel Sandy Bridge platform versus the older one that I’m currently using. As you can expect the tests would be related to gaming in stereo 3D mode and comparing the framerates with both platforms and the different motherboards to see if the upgrade is worth it or not. Pac you boot PC have X GB bandwidth and after 5hourse I have X/2 bandwith, after a PC reboot I should have X GB bandwidth again…which is acceptable…..or is this degradation permanent? I’m asking since I was planing to do some upgrades (my AMD Phenom ii 955 is getting old ) and was looking towards Intel this time… Btw are u selling those 480 cards? :)) J/k As I will need to upgrade my 2xgtx295 too and was thinking if the 500 series is worth the effort compared to 400 series ( all will be water cooled so no noise problems here). So, I thought, I will share here this finding and the solution to this problem. All the credit goes to this Russian guy(s) I just happen to stumble across this about 1 year ago. on my Asus Rampage motherboard and I am running at 4.01Ghz 24/7. The cpu temp is 15 degrees C cooler than when at normal speeds. Very impressive. Yes that is a very good “ready to mount/premade” watercooling solution. I have that one on a system and get around 15-18 degrees lover (+ silence) than the box air cooler. You can over-clock the CPU a little, but nothing to extreme. The Corsair H50-1 is a nice solution if you only want to water cool the CPU and not go for extreme overclocking, but compared to a custom water cooling solution is it also more affordable.